Although Warner Home Video was certainly no stranger to releasing direct-to-video animated superhero films in previous years, they changed the game in 2007 by kicking off their line of DC Universe Original Movies with Superman: Doomsday. Basically, the goal was to adapt popular comic book storylines by sometimes mirroring the original artwork, with well-known actors providing the voiceovers. Not surprisingly, the initiative proved to be a smashing success right out of the gate. In the time since, we’ve been treated to what fans the world over would no doubt describe as modern classics in the form of Batman: The Red Hood and Justice League: The Flashpoint Paradox – each of which adapted their source material to varying accuracy – and even some original tales such as Green Lantern: First Flight and Emerald Knights. Not only that, but two of Frank Miller’s most beloved works – Batman: Year One and The Dark Knight Returns – were both brought to life thanks to the talented filmmakers involved. 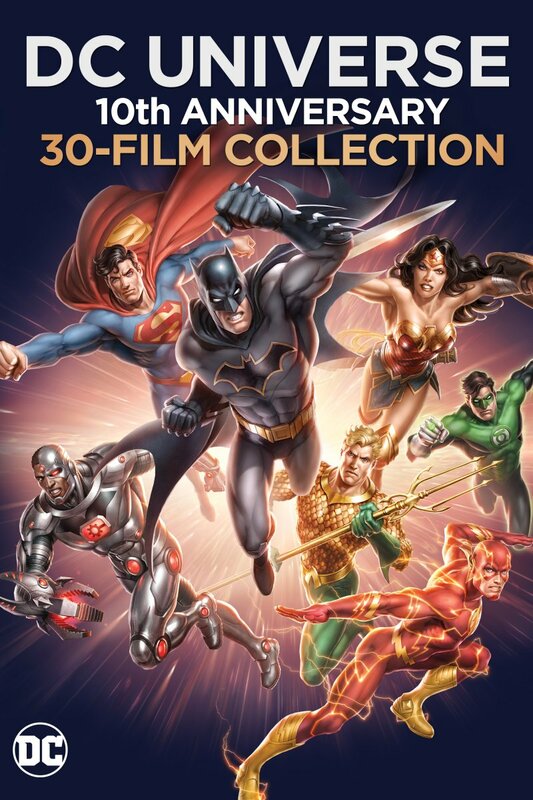 Now, it stands to reason that not all of you have been collecting since the beginning, and that tracking down 30 different pictures can be a bit challenging, but WB has you covered with the upcoming release of DC Universe Original Movies: 10th Anniversary Collection. Slated to arrive via Digital HD on August 15, with a Blu-ray release following on November 7, this would make quite the gift for any superhero lover. Aside from those, expect five shorts – The Spectre, Green Arrow, Jonah Hex, Catwoman and Superman/Shazam: The Return of Black Adam – to be part of the package, in addition to new special features and exclusive collectible items. Some of you may be asking where Batman: Return of the Caped Crusaders and Vixen: The Movie are, but it’s important to remember that those were TV tie-ins, not DC Universe Original Movies.